and to estimate the number of occupied territories. In 2014 we organised a Peregrine Survey to record the number of occupied territories in the UK, Isle of Man and the Channel Islands. Read the provisional results. We are comparing our findings with surveys from 1961, 1971, 1981, 1991 and 2002 to determine change and to inform the future of this once almost extinct species. 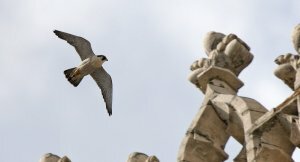 Find out more about Peregrines. Details of the 2014 survey are shown below. The survey was undertaken between March and mid July 2014.The survey is now complete. This survey was suited to experienced volunteers with good knowledge of their local area. We worked closely with Raptor Study Groups and individual Peregrine specialists. Organisation of the Peregrine Survey at the local level varied from region to region. Some regions were organised by a member of a Raptor Study Group whilst others were organised by the BTO Regional Representative, or a combination of the two. The Bird Atlas results suggest a number of areas, mainly in the uplands, from which breeding Peregrines declined in recent years in terms of range or abundance. These include substantial parts of the central, north and west Scottish highlands, south-west Scotland and parts of Cumbria, Wales and areas across Ireland. It is a key requirement of conservation agencies to have up-to-date Peregrine population estimates for each of the 4 countries of the UK (including the Isle of Man and the Channel Islands), and changes at this scale since the last survey. The majority of sites are known and will be revisited as part of this survey. However, we are also including a sampling approach, in order to improve comparisions between areas (and, in the future, years) where there are differences in monitoring efforts. We also wanted to generate some within-country regional estimates, and numbers on sites designated (SPAs and SSSIs) for Peregrines. of decline in the 2002. Surveyors were allocated a randomly selected 5km by 5km square across the Peregrine’s UK range. They were asked to search each square for suitable habitat (e.g. cliffs, crags, quarries, pylons, industrial buildings, cathedrals, bridges) and to look for the presence of Peregrines. Surveyors were encouraged to make 3 visits to the square between March and mid July 2014. The main aim of the first and second visit was to locate Peregrines in the square and establish their breeding status. On your third visit they looked for evidence of breeding success. 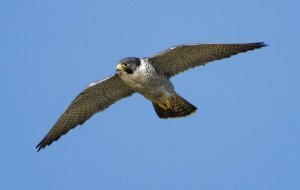 Read about the peliminary results of the Peregrine Survey.